Have you seen something funny or amusing that you want to share with the group? This is the place to do so. As some of you know, when I hear someone say something that, if taken out of context strikes me funny, I make note of it. I’ve done this for years at corporate meetings and have published many of them at this website. I drink a lot, all the time. My beer is always full of fridge. Sooner or later, everything happens. Candidate specified that his availability was limited because Friday, Saturday and Sunday was “drinking time”. “if I valued the honourable gentleman’s opinion, I might get angry”, Churchill responded calmly when an Ulster Member shouted “contemptible” during a … debate in the House. “You’d better get out there. My chihuahua is killing him!”, said the woman. Four year old said he went potty and I asked if it was number 1 or 2 – he said 7, i’m terrified to go into the bathroom. I can’t find my kid’s birth certificate, but apparently I saved one for every Build-a-Bear we own in a special file because I’m insane. I try to explain to my kids during the movie that in reality even a cowardly lion would eat a girl and her little dog. Saw this recently and think it’s amusing. 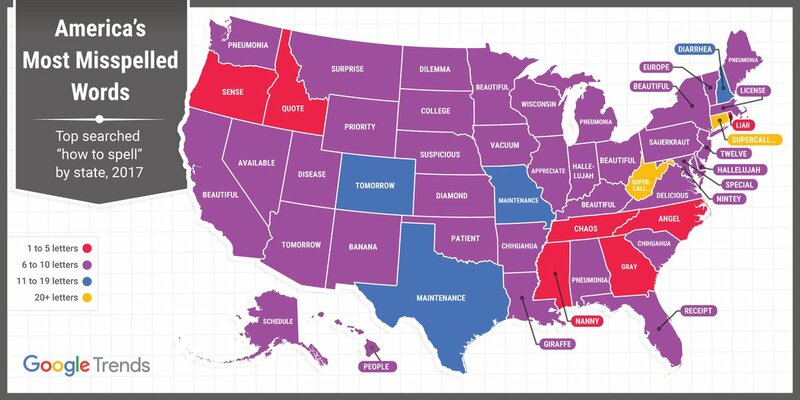 Google published the most searches for “how to spell” a word by state. In my opinion, Pennsylvanians win for actually having a word that I could see people needing to look it up, the others – rather embarrassing. “College”!! seriously South Dakota, come on! and Wisconsin Wisconsin? !